Most of AZ knows about ESA vouchers due to the epic battle against Prop 305 Universal Voucher Expansion in 2018 (which AZ voters rejected by 2:1 margins). But what most Arizonans don’t know is that there is another private school voucher program that has drained over $1 Billion from our public schools – STOs. 1. What does “STO” stand for? 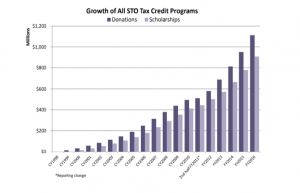 STO stands for School Tuition Organizations, which are private companies that any individual can set up to process tax credits for private school “scholarships” (aka, vouchers). The tax credits can be collected by individuals or corporations. STOs are able to skim 10% off the top of these tax credits in order to administer the vouchers (in other states, this fee is limited to 3-5%). Arizona Christian STO, one of AZ’s largest and oldest STOs, has processed $178.7 million in donations since 1998. ACSTO’s owners (including former AZ Senate President Yarbrough who *coincidentally* advocated for STO expansion) have pocketed nearly $18 million to divert tax dollars to private, Christian schools. 2. Who can use STO vouchers? There are two types of STO vouchers – individual and corporate. Individual STO vouchers are dollar-for-dollar tax credits ($2000 individual; $4000 married) that can be claimed every year to send a child to private school. (In contrast, families wishing to send tax credits to public schools are limited to one-tenth that amount.) Individual STO vouchers are typically utilized by families sending their children to religious schools. Corporations can donate practically unlimited funds to provide tuition “scholarships” (vouchers) for private, religious schools. There’s a “cap,” but it’s never met. There are some slight limitations on corporate STO vouchers, but not many. The Low Income Corporate STO can fund vouchers for “low-income” students (a family of 4 making less than $107,000 per year qualifies) who are switching from public schools, members of military families, or enrolling in kindergarten. The Disabled/Displaced Corporate STO can fund vouchers to children with special needs or foster placement. 3. Do STO vouchers divert funds from public schools? STO vouchers siphon nearly $160 Million from our public schools each year – the equivalent of a 5% raise for educators, or the hiring of 2500 new teachers, or a laptop for every student in the state. You get the picture, it’s a LOT of money — more than $1 BILLION dollars since the program started in 1998. 4. Are there limitations on STO vouchers? Yes and no. There is no limit to how much a corporation can donate each year, which creates $48 million in corporate tax credits each year. Astoundingly, the cap on STO vouchers automatically increases by 20% every year, and will reach $383 Million by 2027. In the next 10 years, corporations will be able to donate half a billion dollars per year to STOs, meaning they will have $0 in corporate tax liability. Individual families are limited to $4000 per year. While is illegal to earmark donations to “swap” scholarships (you donate $4000 for my child, I’ll donate $4000 for yours), this is a common practice and there is little to no oversight. “Switcher” STOs vouchers are only offered to students opting out of public schools. 5. Are STO vouchers legal? Surprisingly, yes. 93% of students receiving an STO voucher attend a school with a religious affiliation, yet Kotterman v. Killian (1999) determined that STO vouchers do not violate the separation of church and state, because they do “not overly entangle the government with religion because the state does not distribute funds or monitor their application.” Broken down, the court ruled that because the money goes to a third-party voucher broker, the state is effectively separated from the church. Much like ESAs, Arizona has been the national petri dish for the STO voucher program for the past 18 years. Many other states have seen similar programs introduced in their legislatures, and many states have successfully staved them off. Some states have pointed to Arizona’s failed system as an example of what can go wrong when voucher brokers are attracted by extremely high profits rather than excellent educational outcomes. Several Arizona lawmakers have introduced bills this Legislative session calling for a sharp decrease in the automatic STO cap growth. Others have called for a reduction of the “voucher broker” admin fee, lowering it from 10 to 5%. These are excellent reforms. Last year, the Legislature failed to further expand STO vouchers. 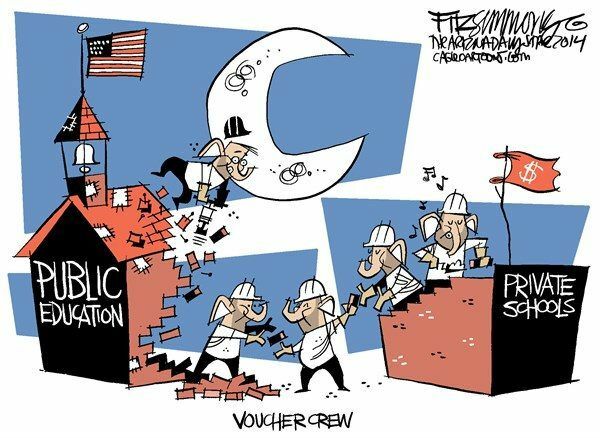 But, vouchers are like vampires, they never die. Thus far, there have been zero STO voucher expansion bills introduced this session. See our SOSAZ Legislative Update to stay up to date. Still have questions? Email us at policy@sosarizona.org or message us on Facebook!